Good Friday, Silent Saturday, Easter Sunday. I have asked God to make this weekend meaningful for me spiritually and hope to lend some assistance in making your Easter weekend spiritually meaningful as well. As our country prepares to select candidates for our next presidential election, Americans are abuzz with talk about our next leadership options. I hear tones of hope from some people. From others I hear fear as they face a set of voting options, none of which they like. And I ask, where is God in all of this? On this Good Friday I am assured that He never loses sovereign control over history. And for those feeling angry, discouraged or fearful in this election process, let’s look at Pilate on this historic Friday. in order to please a crowd. A weak leader indeed. A crowd-pleaser. A leader who thought he could somehow wash his hands (literally) and not be held responsible for decisions he made. And all the while, God had not lost control over one detail. Our Savior was headed toward paying the price for our sins. Though Pilate was weak, God’s perfect plan for our salvation was unfolding perfectly. Nothing was going wrong…not really. We will all cast our votes for the next president of the United States. If a leader is chosen that we view as weak, then rest assured God hasn’t lost one iota of control over His over-arching story for our history. What we should fear, however, is the vote we are casting about who is going to lead us in God’s eternal story. Are we casting our vote for the Savior who died for our sins and proved He has power over death by raising from the dead? 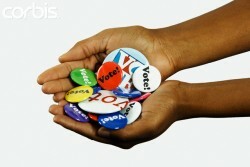 Or are we casting our vote for our good works, or perhaps another person still laying in a grave somewhere, still dead? That is a voting outcome that should concern us far more. This Good Friday I am grateful for the proof that earthly leaders do not stop God’s story.